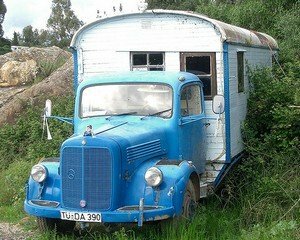 Can I Convert an old RV to Electric? Is there a conversion kit available for RVs and vans? I have a 1976 RV that I would like to convert to electric. I also have a 1973 van. Both the RV and van are made by Dodge. Can they be converted, or will I have to forget about it? No, there's not a conversion kit for vehicles that large that I know of. That doesn't mean it can't be done, but there may be some reasons why you wouldn't want to. Your vehicles are pretty heavy. All that weight has to be moved, which is easy for the gigantic diesel engine or V8 that they were born with. Just burn more gas, 10 mpg or so, and move that mammoth down the road! Now, when you convert that mammoth to electric, instead of moving it with petrol, you're moving it with batteries, usually lead batteries. The heavier the vehicle, the more lead batteries you need. Lead weighs a lot. Your vehicles weigh a lot. There comes a point where you can build an electric vehicle that needs so many batteries to just get ROLLING that your effective range will be, maybe, to the end of your driveway. So even if it's possible, there are going to be folks who will argue that it's not the most sensible conversion ever. If we didn't try things that somebody thought weren't sensible, though, nothing interesting would ever get done. Me, I'd convert both those vehicles to electric, just because somebody said I shouldn't. I'd put in two big AC motors, lift the whole chassis up a foot or so and install battery boxes under the whole length of the floor, beef up the suspension and brakes, and be on my way. Even if it's expensive - and it is - consider this: it's still probably cheaper than filling the tank these days. She's just the coolest old gal in the world and I want to bring her into a new age. Basically I want to replace the engine and transmission with an electric drive of comparable torque, using the spare weight and space for the batteries. The added spin is that I have a huge (5 foot by ~9 foot) tilting fiberglass top that would be perfect for some high-wattage solar panels. I can see someone's already asked the question about the electric generators as well. I've seen the usual address to this question - they point at the rule book and that's it, there's no attempt to try to actually make it happen. It doesn't even have to count as perpetual motion, but I don't see what it could hurt to gather as much kinetic energy back from those spinning surfaces as possible. Of course the beast would also be chargeable from a land line, but these other recapture sources I hope would increase the drive time dramatically (and refueling on long journeys might be as simple as spending a few more hours at the camping spot).. 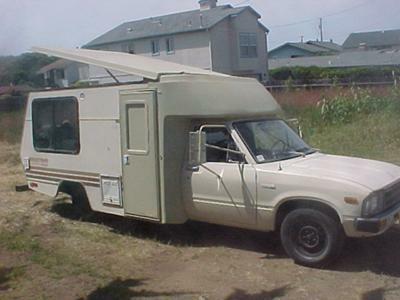 The truck is your standard 1/2-ton rear-wheel-drive '82 Toyota and the motorhome is built onto the chassis. There have been problems with these old things before with excess weight on the back axle, but this one is especially light. The conversion seems like it wouldn't add alot of extra weight but might actually take a bit off. I would also be looking into using the panels and the batteries to power my fridge in 115 AC mode or propane-aided 12V DC mode as well as my other accessories and maybe even my AC transformer. I know this might involve a few thousand dollars, and I am short on cash, which is why I'd thought about exploring some green-volunteer options, if such a thing existed. I think the uniqueness of the vehicle and especially all that perfect space for the solar panels might qualify it for a sweepstakes or something, who knows? You've got a very good idea there. That roof would seem to be perfect for solar panels, especially the very lightweight roll-out variety invented by Stan Oshinsky of "Who Killed the Electric Car?" fame. Don't let anyone tell you stuff CAN'T be done, because, as you pointed out, the only way you'll know what can be done is to try it! P.S. If you haven't seen this article yet about the amazing potential of solar power, have a look!